I love this! 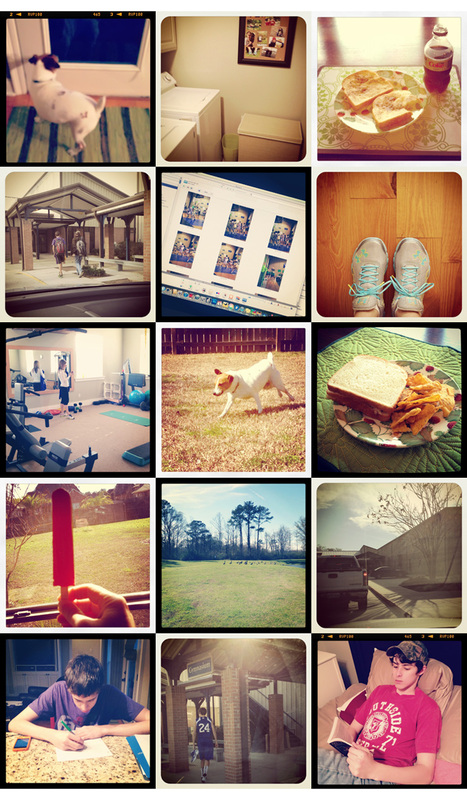 Did you have a template or how did you get your instagrams in the grid format? So fun! Love how you did in on instagram - your dog is seriously too cute too! Makes me miss having a pooch! Neat collage of your Wednesday. I had to giggle over the first one of your dog at the window. That's where my dog always is. Only she puts her nose right up against the glass. I love this and your project life. I hope to start working on project life when I am done with my 365 in a week or so. You do such a great job at getting pictures of your boys...I hope I can do it too (of my boys:). I love it! and I noticed your laundry is done. That's just AWESOME!!! I'm not brave enough to take a picture of my laundry room. LOL! I love this meme! it's so low key and relaxed. . .I think that's what makes it so fun. Uhhh, unless I'm doing it wrong. If I am thanks for not telling me. :) LOL!!! This day in the life project is something I've had on my photography to do list for quite a while. I love how yours turned out! Thanks for the inspiration. It looks like a photo diary. If you continue this album, it will be very good memories. What fun! I hope my this and That Entry is still ok as I posted earlier before I knew about this. What a great idea. I have tried to do it a few times - then forget 1/2 way through the day. PS... Love your placemats. what a fun idea to film a whole day with instagram. Love it! I love this!! Great idea and lovely shots. I think this is a great way to mark and remember your day. I think Day in the Life photos are so much fun. I did it last year and had the hardest time picking which photos to keep (too many memories attached to each). LOL It looks like you had a fun day. I loved seeing your daily photos on Instagram yesterday. So much fun! I keep planning to do the 10 on 10 again, but somehow it's hard to do. But it's tomorrow so I'm hoping I can get it done! I love the snapshot moments of your day - it looks like it was a very good one! Great shots and a fantastic way to record your day. What a fun idea! I've gotta try it! What a fun day. I need to do this next year (I assume it's a once a year thing). Looks like a great day. Love your photos. What a great idea to journal your day! I knew there was a reason I wanted to get that iPhone! Thanks for posting this Deb. I had a look also at Ali Edwards website and that Project Life looks amazing. Something i would like to try. i love your photos... it's great to look back on your day and appreciate the little things. How fun! I love all your little snapshots. Next time you plan to do "A Day in the Life", give us a heads up. I would love to join you in that challenge. Great photos - what a lovely day you had!! I joined Day in the Life too. It was so much fun to do I'll be doing it again next month. :)Love seeing a glimpse in your day! What a great idea. I need to do something like that, but it would be really hard to not get a picture of Little Lady since she is a HUGE part of my day. what a neat idea! well done Deb! This looks like fun! I have to put this on the list of things to try. Great post! Deb, can you get all the squares with rounded corners in your board?